*Full Software includes all the tools described on this site. **Savvy Lite is restricted to only the Savvy Compare tool. 2. Make Payment through Paypal. Following Paypal approval of this payment you will be able to download the software. To complete the license activation you will need to request the activation key from tellmemore@xlsavvy.com (nb. users will still be able to use the software for 30 days without the activation key). THE FOLLOWING LICENCE AGREEMENT REGULATES ALL USE OF ExcelSavvy TM. This is a legal agreement between you (either an individual or an entity) and ExcelSavvy Co. You should read the following terms and conditions carefully before using this software, as your use of ExcelSavvy indicates your acceptance of this Licence Agreement and Warranty. This Software Licence Agreement ("Licence") permits you to use one copy of ExcelSavvy on one workstation. 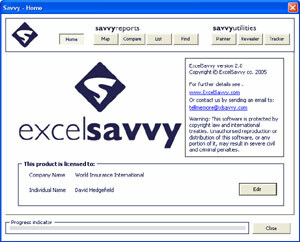 The primary user of the computer on which the ExcelSavvy is installed may make a second copy for his or her exclusive use on a portable computer. If you have multiple Licences for ExcelSavvy, then at any time you may have as many copies of ExcelSavvy in use as you have Licences. ExcelSavvy is "in use" on a computer when it is loading into the temporary memory (i.e. RAM) or installed into the permanent memory (e.g. hard disk, CD-ROM or other storage device on that computer. 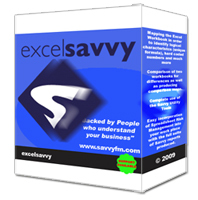 You may have access to ExcelSavvy through a network, provided that you have obtained individual Licences for the software covering all workstations that will access the software. Note that each workstation must have its own Licence regardless of whether ExcelSavvy is being used on all computers concurrently. ExcelSavvy is owned by ExcelSavvy Co and is protected by copyright laws in international treaty provisions. Therefore, you must treat ExcelSavvy like any other copyrighted material (e.g. a book or musical recording) except that you may either (a) make one copy of ExcelSavvy for backup or archival purposes, or (b) transfer ExcelSavvy to single hard disk provided you keep the original solely for backup or archival purposes. You may not copy or redistribute in any way the user documentation provided with ExcelSavvy, except for you own authorised use. You may not reverse engineer, decompile, disassemble, modify, translate or make any attempt to discover the source code of ExcelSavvy. You may not create derivative works from ExcelSavvy. You may not sublicence, rent or lease ExcelSavvy. You may not assign or transfer this Licence to a third party. ExcelSavvy Co warrants that ExcelSavvy will perform substantially in accordance with the user documentation for a period of thirty (30) days from date of receipt. Any implied warranties on ExcelSavvy are limited to thirty (30) days. ExcelSavvy Co does not warrant that the functions contained within ExcelSavvy will meet your requirements or that the operation of the software will be uninterrupted or error free. In no event will ExcelSavvy Co be liable for any special, consequential, indirect or similar damages, including any lost profits or lost data arising out of the use or inability to use ExcelSavvy even if ExcelSavvy Co has been advised of the possibility of such damages. In the event of any other losses, the liability of ExcelSavvy Co will be limited to the cost of this Licence. Grant of this Licence does not imply continued support or maintenance of this software by ExcelSavvy Co. The terms and conditions of the Licence may not be varied with the express written consent of ExcelSavvy Co.
Any breach of the terms and conditions of the Licence by the licensee will result in immediate termination of the licensee's rights under this Licence. However, while a breach limits the rights of the licensee to ExcelSavvy, it in no way limits the continuing obligations of the licensee with respect to this Licence. In the event of a breach, all ExcelSavvy software and documentation must be returned to ExcelSavvy Co and all traces of ExcelSavvy software must be deleted from computers owned or operated by the licensee. Categories of damages include, but are not limited to, lost profits on the part of ExcelSavvy Co. This Licence is governed by the Laws of England. Please note that by purchasing this software, the user is also agreeing to the Software Agreement stated above.